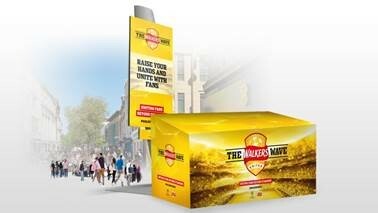 Reading, 19th May 2017 – In a bid to unite fans and celebrate the world’s most watched annual sporting occasion that is the UEFA Champions League Final, Walkers as Official Sponsor of the UEFA Champions League is creating the world’s most inclusive and immersive #WalkersWave. From Monday 24nd May for two weeks, fans in Cardiff for the UEFA Champions League Final can take part in the #WalkersWave. In a ‘dug out’ on Queen Street, fans and two of their friends can sit down, wait for the countdown from Walkers’ long-standing ambassador Gary Lineker before standing up to wave. Using the latest in interactive digital OOH technology that combines augmented reality, social media integration and dynamic delivery, the recorded wave will feature the fans waving with Gary by their side. 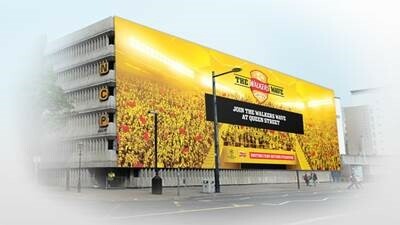 The wave will be projected on the digital billboard opposite the dug out and participants will be able to instantly share their part in the #WalkersWave across their social channels. By taking part, they will also be entered into a draw to win a pair of tickets to the UEFA Champions League Final. Taking it one step further, Walkers will add each new recorded wave to a giant outdoor digital ‘supporters stand’ opposite the entrance to the National Stadium of Wales, where the UEFA Champions League Final game will take place. This is a unique opportunity for Walkers to unite fans at the game and those watching the game at home – by sharing a selfie with the #WalkersWave hashtag, participants will be part of a FAN wave at the heart of the action and also have the chance to win tickets to the UEFA Champions League Final. The #WalkersWave will take place every day between 10am and 8pm from Monday 22nd May to Sunday 4th June, the day after the UEFA Champions League Final.